Japan’s Yuzuru Hanyu turned in a near-flawless performance in the men’s short program. Four of a kind may be a winner at most tables but in men’s figure skating these days all it does at the World Championships is get you a seat. More than a third of the 30 competitors in Wednesday night’s short program at TD Garden tried a quadruple jump and the top contenders essayed two. 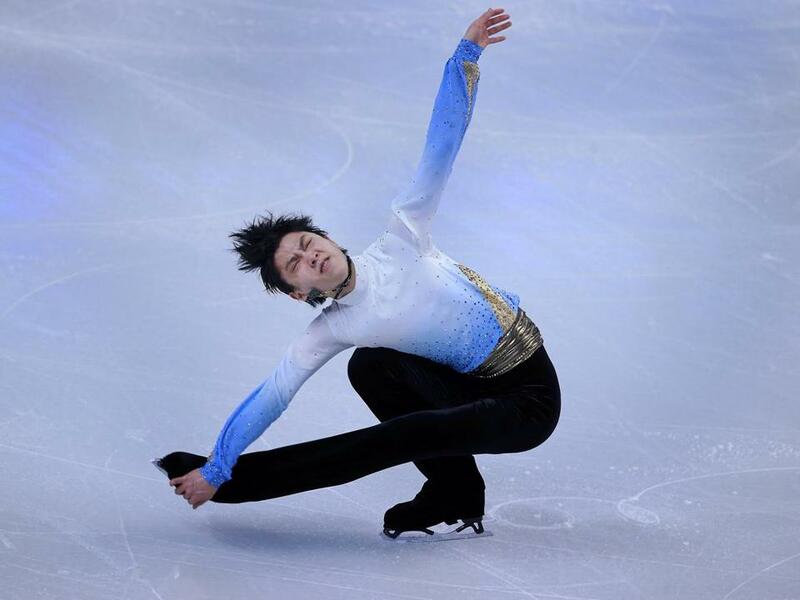 And when the quadfest ended after four hours of soaring and splatter, it was Japan’s Yuzuru Hanyu, the Olympic champion who was a leap and a bound ahead of the rest with a flawless and mesmerizing performance. Hanyu, who won the Olympic gold medal two years ago in Sochi, landed his opening quadruple salchow jump and followed it with a clean quad toe-triple toe combination to post a near-record 110.56 points. Fernandez, who lifted the title from Hanyu last year, hit his opening quad toe-triple toe combination but fell on the ensuing quad salchow. The US skater’s physical talent is unquestioned, but she has been plagued by inconsistency. For the American men, who haven’t won a global medal since 2009, their longest drought in nearly four decades, making the podium on Friday figured to be a long shot. The more realistic goal was to preserve three entries for next year’s championships in Helsinki, which will determine each country’s spots for the 2018 Olympics in South Korea. So when US champ Adam Rippon and former domestic titlist Max Aaron placed seventh and eighth, they put themselves in a position to at least achieve that goal. Rippon and Aaron are seeking redemption as much as anything. With two Olympic berths on the line at the US championships here two years ago Aaron, who came in as champion, missed the team and Rippon finished a distant eighth. Hanyu, who just missed breaking the world mark of 110.95 that he set at the Grand Prix Final, was delighted with his, screaming “yeah!” and clapping for himself as he skated off the ice. 1. Yuzuru Hanyu, Japan, 110.56. 3. Patrick Chan, Canada, 94.84. 4. Shoma Uno, Japan, 90.75. 5. Jin Boyang, China, 89.86. 6. Mikhail Kolyada, Russia, 89.66. 7. Adam Rippon, United States, 85.72. 8. Max Aaron, United States, 81.28. 9. Ivan Righini, Italy, 81.17. 10. Deniss Vasiljevs, Latvia, 81.07. 12. Denis Ten, Kazakhstan, 78.55. 13. Maxim Kovtun, Russia, 78.46. 14. Jorik Hendrickx, Belgium, 77.72. 16. Grant Hochstein, United States, 74.81. 17. Brendan Kerry, Australia, 71.04. 18. Lee June Hyoung, South Korea, 70.05. 19. Alexei Bychenko, Israel, 69.86. 20. Chafik Besseghier, France, 69.23. 21. Phillip Harris, Britain, 68.53. 22. Julian Yee, Malaysia, 67.60. 23. Michael Christian Martinez, Philippines, 66.98. 24. Ivan Pavlov, Ukraine, 65.20. 25. Javier Raya, Spain, 65.06. 26. Yan Han, China, 62.56. 27. Nam Nguyen, Canada, 61.61. 28. Franz Streubel, Germany, 57.19. 29. Denis Margalik, Argentina, 52.31. 30. Slavik Hayrapetyan, Armenia, 49.36.